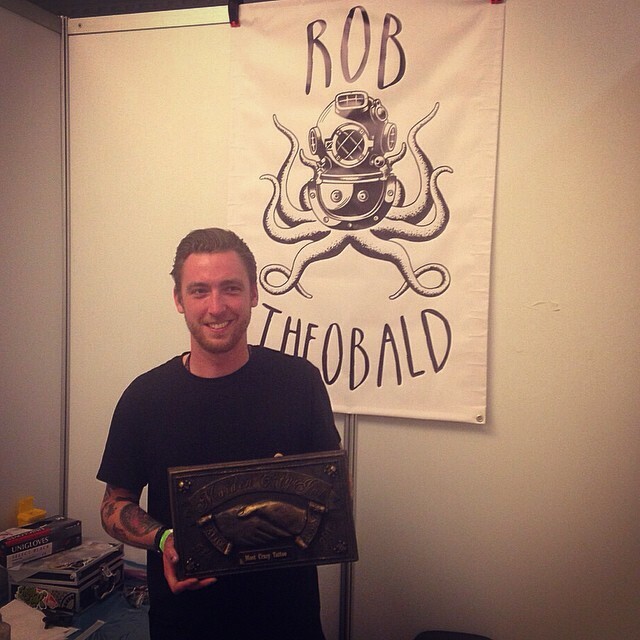 This interview, the 1st in a series where I will be chatting to Tattooists who not only have passion for their trade, but also for angling, will be with my colleague and good friend, Robert Theobald. I first met Rob maybe 3 or 4 years ago, when he came to me for a tattoo of a Carp on his leg. We had spoken before via social media, and both working within the same town, were both aware of each others work, as well as our similarity in what we choose to do in our spare time. 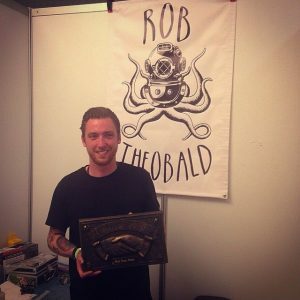 We kept in touch, and when I came to open Low Tide Tattoo in 2014 Rob was the first artist I approached to offer a position with the shop. Fast forward 2 years later and not only has our working relationship boomed (along with everyone else in the studio), we have found ourselves spending nearly as much time out on the bank together as we do working! So when we was bouncing around the premise for this series of interviews, it was obvious that Rob was the perfect candidate to kick things off! Studio: Low Tide Tattoo, Southend-on-Sea, Essex. 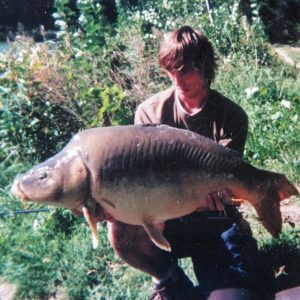 RT: I’ve been fishing for probably close to 18 years, if not more, but if we’re talking seriously targeting Carp then around 15 years. In regards to tattooing it’s starting to approach 6 years in different shops, from the very beginning to now. How did you get in to it?? 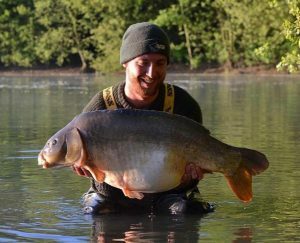 RT: I was quite lucky in that a good friend of my Dads’ was a very competent Carp angler, and after having a few trips with him and my Dad, where I was more just “general angling” with floats and feeders, I started to get more and more interested in targeting Carp more seriously and specifically. So, from there, I had a friend who was also quite interested, both being quite young we hit the local day ticket lakes and park lakes, before progressing on to a local club called Colony Lakes, which interestingly I have returned to in recent years. The interest just grew from there, and as time went on I just fished more and more venues, locally and further afield. My way in to tattooing was really down to a lot of persistence and patience! I was very keen to carve myself a path in to the trade, so I compiled a portfolio of artwork and visited all the local studios, seeking out an apprenticeship, until one decided to give me a chance. The first proper studio was a place called ‘Exile’, but I had previously got a spot in a lesser known shop for a short period. The two shops were vastly different, and I was lucky in the fact that the guys in ‘Exile’ actively encouraged me to take a step back from what I had been doing at the former studio, learn the trade in the correct manner and progress through the steps as I should. RT: My earliest fishing memory, would have been when I was very young. My Dad used to do a bit of Sea fishing, and would quite often come home in the early hours of the morning or even the middle of the night. He would wake me up to show me what he had caught on the trip, and I would watch on as he prepared and cleaned the fish in the sink, which would later be food for our whole family. He did, possibly reluctantly, take me out Sea fishing a few times, but I was maybe a bit young to be too interested and it wasn’t until he started taking me out to lakes, float fishing for smaller species that it really grabbed my attention. Similarly it was with a member of my family that I had my first encounter with tattoos, this time my Grandad. I remember he had a really old Swallow on his forearm, that even then was more of a blob than anything else, but I was super fascinated by it, and even at that young age I knew from then that I wanted to get one myself. And once I had got my first, I got more, and the interest grew from there! RT: One of the biggest, notable, milestones within my tattooing career would have had to have been working my first convention. It meant stepping out of the comfort of the studio, putting myself and my work on show for all to see and working alongside lots of other artists, many of whom I looked up to and admired. And as far as conventions go, it was successful to a degree and although it’s not the busiest I’ve been at a convention by any means, it was a nice experience to cut my teeth on. 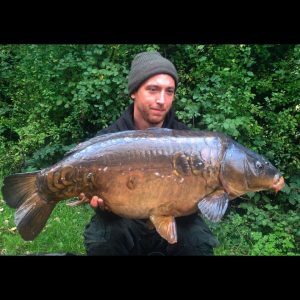 The obvious answer within my angling would be all the different PB’s over the years, but for me it was probably the sort of time where I started to feel like things came together. It’s hard to pinpoint an exact time or date, but there would have been a point where I felt my understanding and experience was truly and positively effecting my catch rate, and I no longer felt like I was just catching due to luck or random coincidence. One particular instance which sticks in my head, going back to the “club lake” that I mentioned earlier, was that there was a couple of different lakes on the complex, one of them being exclusive and only available to a select few with a certain membership. Me and a friend were allowed to fish it for one night only, and knowing we weren’t likely to be given that many opportunities to fish that lake, I was made up when I managed to nick a fish, which I probably consider to be my first “decent” Carp. But, truthfully there’s been so many highlights within my angling life, I would find it very difficult to single one out on it’s own. 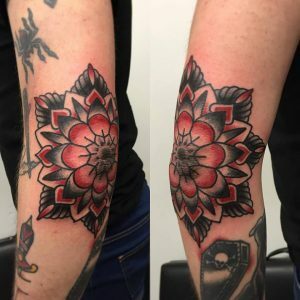 RT: I’ve always leaned towards the ‘Traditional’ style within tattooing, bold lines, bold colours with timeless designs that have survived time and are still relevant and popular to this day. But, recently I’ve really found myself more interested in geometric, “blackwork”. But, honestly, I enjoy tattooing most styles and it’s more what I’m “in to” at any one time rather than over all. I enjoy being active with my fishing, moving around, working for bites. So the obvious answer for me would be surface/floater fishing. There’s so much more to it than people would believe! The visual aspect, of actually seeing this fish you’re attempting to catch and being able to witness that moment where they decide whether to take your hook bait is heart stopping! Sitting behind a set of rods, waiting for a run just doesn’t compare in my opinion. RT: It’s a similar answer for both tattooing and fishing for this question really. My main target is just to improve! Hone my skills, get better, feel more confident and comfortable, carve myself out a good reputation and just enjoy it! I suppose it all comes down to consistency, and I think that’s what I strive for overall. RT: There’s a hell of a lot of tattoo artists that I look up to and admire their work, and think “that’s the sort of direction I want to take”. But, I don’t think I can really pin point any particular specific names, and it’s similar in my fishing. There’s so many fantastic anglers local to me that no one would have ever heard of them, but they are incredibly talented, putting fish on the bank very regularly and have been for many, many years. In terms of both angling and tattooing, I have a lot of respect and admiration for the older generation, the guys who paved the way for us to be doing what we love to this very day. A lot of people tend to overlook these guys, but they forget there is a lot to be learned from other anglers/tattooists and some of these guys have been doing it since well before I was even born! 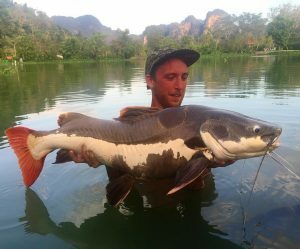 RT: I am actually very lucky in that I’ve already fished and tattooed in my dream location, and that is Thailand.. It’s a beautiful country, the fishing is out of this world, and the tattooing is growing from strength to strength every day, being pushed further and further by the guys out there who want it to be as successful as it possibly could be. RT: One aspect of tattooing that really does wind me up is the huge exposure and misrepresentation by mass media and TV. 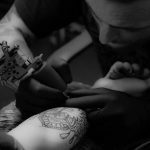 It’s bred a generation of tattooists and even clientele that seem to believe they know everything there is to know about the trade, despite only being part of it for equates to about five minutes. And not only that, the tattoos that these programmes push as being “good work” or artists as the “best artists”, really aren’t and it’s muddying the view of the general public, along with lowering their expectations as to what they should be looking for in a good artist that creates good tattoos. There’s not really too much that annoys me within fishing. There are obviously small things that happen that I don’t like or I might disagree with, but for the most part it’s nothing so bad that it outweighs the good parts of something I love so much. RT: Apart from the obvious answer of having to have that “attention to detail” aspect to make both successful, the one parallel I can draw between tattooing and fishing is my feeling that both disciplines require you to serve an “apprenticeship”. It’s all too common nowadays within angling that young anglers want to jump straight in and start catching 30’s, without learning the grass roots, catching Roach, Rudd, Perch and then graduating on from there. And the same can be said in tattooing, a lot of tattooists new to the game think they can steam straight in, doing sleeves, backpieces and working conventions. It seems to have been forgotten that a hell of a lot can be learned from the starting at the bottom, getting all the basics right before moving on to larger and more intricate ideas. So I guess in essence I’m just saying that to be a successful and well round angler and tattooist, I think people need to take things slow, learn the ropes and progress naturally without the want to run before they can walk!